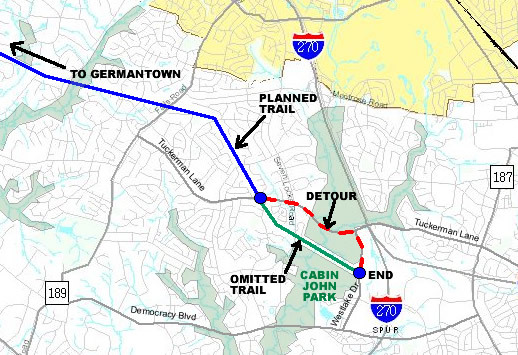 Please include the full PEPCO trail in the Bicycle Master Plan, including the paved segment to Westlake Drive. A link between Germantown Recreational Park and Cabin John Park would be invaluable for recreation as well as bicycle commuting. To join these two amazing parks would be an incredible accomplishment for MoCo. The detour with 2 busy at grade crossings and driveways is not suitable for this family friendly type of trail. Please don’t don’t give up on the last mile. There are work arounds and solutions for the steep grade. A paved trail (with a parallel unpaved path?) should be possible with some thought and creativity. Please include a quality link between the two parks, not just a detour. As a retired MoCo resident, I am spending more and more time on MoCo bike trails and less time driving to destinations. Keep making MoCo one of the best places in the country to bike! Thanks for listening. Thank you for writing! Good news: The County Council voted to include the missing mile of the PEPCO trail in the Bicycle Master Plan! I know they were impressed by letters from citizens like you urging them to support it. It made the difference. They even made this trail a “Tier 1” priority, meaning it’s considered high priority. The Planning Board should never have tried to omit this segment from the plan. But we’re grateful to the Council for overruling them.